Synopsis: In Red 2, the high-octane action-comedy sequel to the worldwide sleeper hit, retired black-ops CIA agent Frank Moses reunites his unlikely team of elite operatives for a global quest to track down a missing, next-generation lethal device that can change the balance of world power. To succeed, they’ll need to survive an army of relentless assassins, ruthless terrorists and power-crazed government officials, all eager to get their hands on the technologically advanced super weapon. The mission takes Frank and his motley crew to Paris, London and Moscow. Outgunned and outmanned, they have only their cunning wits, their old-school skills, and each other to rely on as they try to save the world-and stay alive in the process. When it comes to serviceable sequels, Red 2 should be the poster child going forward. The film doesn’t try to rehash old plot beats, but it also doesn’t step too far out of its comfort zone. It hopes merely to get by. The phrase “getting the band back together” feels the most appropriate here, as Red 2 brings back most of the characters from Red and puts them to good use. Bruce Willis is back as Frank Moses, the retired CIA agent with a few gallons left in the tank, as is Mary Louise Parker as his new girlfriend Sarah, John Malkovich as Moses’ longtime pal Marvin, and Helen Mirren as Victoria. As far as the cast is concerned, if you were a fan of the group dynamic in the first film, I’m happy to report all those relationships are well preserved in the sequel. 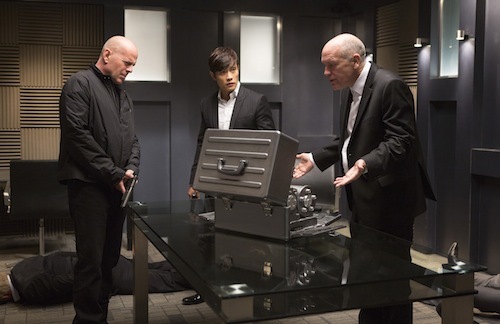 Of course, there are a few additions for Red 2, including Catherine Zeta Jones, Anthony Hopkins, and G.I. Joe‘s Byung-hun Lee. Each fits into a standard archetype for the film (villain, ex-lover, etc. ), and perform admirably. The real standout, though, is Lee. His stunt work, or should I say youth, adds a much needed change of pace to a film filled with aged stars. As far as the film as a whole is concerned, Red 2 is a little light in a few key areas – specifically in action – but it more than makes up for it on the backs of its leads. Willis, Parker, and Malkovich clearly have a great rapport with each other, and any scene with the three of them, or just Willis and Malkovich, is a joy. Yes, the story is pretty flimsy when you think about it, and the action misses the mark some of the time, but Red 2 succeeds where it needs to. It also doesn’t put the main characters into similar situations, or retread familiar ideas from the first film; it is a sequel in all the right ways. Moreover, the character dynamics have changed since the first film, and so a lot of scenes play out in new and interesting ways. Mary Louise Parker’s character, for example, is no longer the sheltered girl from Kansas; she now actively seeks adventure, even at the detriment of Moses. It’s those new arcs that reinvigorate your interest in the characters, and make Red 2 feel fresh where it counts. Overall, fans of the first film will come away from Red 2 satisfied. The story has its own interesting twists and turns, a great sense of humor, and its cast is as strong as ever. Also like the first film, Red 2 has its fair share of problems, but those don’t bog the film down in any appreciable way. Red 2 is the type of sequel that most studios set out to make: a close relative of the first film that knows how to balance (quite literally) the new with the old. I don’t remember the action in the first Red being all that memorable, and I suspect most will say the same thing about Red 2. There are some big, CGI-heavy moments towards the end of the film, but the majority of the action is fairly generic. The action is also edited in that typical quick-cut, disorienting fashion wherein it’s hard to keep track of who’s doing what. That is likely a byproduct of heavy stunt double usage, but nonetheless the action overall isn’t particularly exciting. Byung-hun Lee’s scenes are perhaps the best in the film, but that’s sort of missing the point. Most want to see Bruce Willis in full (or at least partial) action mode, but most of his scenes are fairly blase. Although Red 2 is billed as an action/comedy it feels like more of a comedy than anything else. While the first film poked fun at the ages of its stars, Red 2 uses a much broader spectrum for its humor. Malkovich is still the standout as far as the whacky humor is concerned, but Mary Louise Parker does well as Moses’ girlfriend. In fact, most of the film’s biggest laughs are either solely created by her, or based off a character’s reaction to her. In a lot of ways, this feels like her film, not Willis’, and that was perfectly fine by me. I think that letting Willis play second fiddle helps his trademark reactions land even harder. Red 2‘s humor is fairly broad, with a touch of the absurd thrown in to keep moviegoers on their toes. I wouldn’t say Red 2 is hilarious, but it’s just as funny as its predecessor albeit with some of that initial appeal diminished.